MP&N #2’s builder photo, 1905. Car #202 was built in 1905 by the Pullman Company for the Mineral Point & Northern Railway as a First Class Coach. Sold to the Cazenovia Southern Railway in the 1920s, it underwent an unusual change, which allowed the handling of baggage, Railway Express items and mail pouches as well as passengers. Ordinary combination cars were fairly common, especially on shortlines where light traffic and frugality were a fact of life. The little Cazenovia Southern, just six miles long, provided passenger and freight service from Cazenovia in Richland County northerly into Sauk County through Ironton to the Chicago & North Western connection at LaValle. 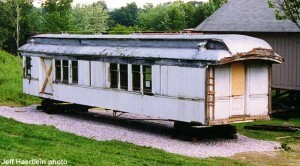 Depots in all three locations happened to be located on the same side of the track, leading to the creation of a most unusual railroad car with a split personality. On one side it was a combination car with a baggage door; the other side appeared to be a regular coach-no baggage door! Seemed sensible, considering the second door wasn’t needed! Major floods in the summer of 1935 doomed the line, and by 1937 the “Caz” was officially abandoned, ending the railroad career of the 202, but not its useful life. Moved to a vacant lot in Lake Delton, the 202 served variously as a residence, summer cottage, antique shop and storage shed for over six decades, more than twice as long as its railroad career. In July 1999, the car was donated to Mid-Continent by Sue Benson and her sister Teresa Reno, further ensuring its future. It has been moved to North Freedom. Research and planning are underway to provide for preservation and restoration of the #202 in the future.